Fun things to do around the Fire-pit this Summer! Fire-pits are quickly becoming the centrepiece in any garden – just like the hearth, the fire-pit becomes a centralized meeting point. Now that the weather is beautiful once again, spending the days and evenings outside seems far less discouraging. An afternoon relaxing with a book, dinners outside, a drink with friends, the garden has much more room and ambience to offer than any inside room. If you’re planning a gathering of friends and family, try some of these fun activities to make the night memorable. 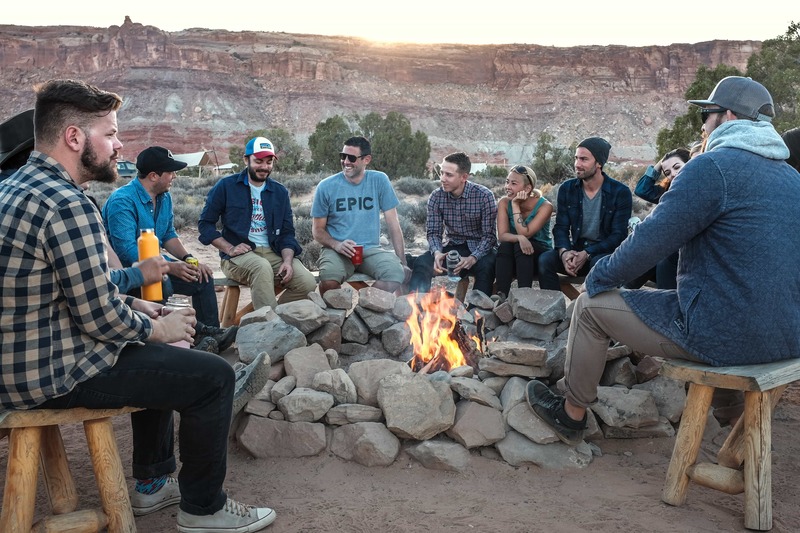 When hosting an outside activity around a fire, the go-to activity is usually centred around food. Hot dogs make a great savory treat when accompanied by ketchup and mustard, a BBQ classic! Nobody wants to wait around for food, so getting your fire started quicker and stronger is crucial. Using a Firebuilder makes starting your fire easier than ever – simply break the cardboard brick, light the edges, place it on top of your solid fuel and let the fire burn downwards. As a kindling-and-firestarter-in-one (with no added chemicals like kerosene) your fire will be roaring before you know it. It might sound cheesy, but sometimes there’s really nothing better than a good group sing-along around the fire! Grab your guitar and strike a few chords, you’re bound to find a song that everyone knows the words to. You can even bring out some kitchen objects and get a full DIY orchestra going! Whether it’s a spooky ghost story, or an embarrassing memory, stories by the fireside are a time-old tradition. With the added help of Firemizer, your solid fuel will last up to a third longer, meaning less interference and more time to share. Simply place a Firemizer at the base of your fire-pit, place your fuel on top and let the unique steel-alloy grid help your fuel to burn more evenly and efficiently (whilst also reducing any harmful pollutants by 72%). Get the most out of your fire-pit this Summer with the help of Firebuilder and Firemizer, and make those summer nights last as long as possible. How to keep Your Pets Fire Safe? How To clean Your Fire! Best Wood For your Stove! Follow Firemizer for exclusive offers, competitions and all the latest news – plus handy hints and tips for a more efficient fire.